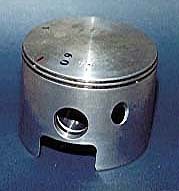 I was lucky to find a brand new piston at Mr. Kaboli's office. 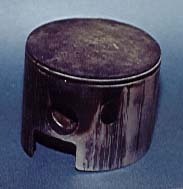 This was a +.25 350 piston for Pursang model, and after consulting with Tim Weaver of Hugh's Bultaco, I decided to use it. I had a pair of piston rings made for it by Fouladi Brothers, Tehran's best ring sellers. 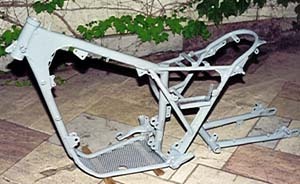 Body and rear fork, powder coated. My choice of color was limited and instead of the original metalic silver I had to use this light gray color. Because of the worn piston and cylinder I had to send the cylinder for reboring. It was done professionally by Central Grinding & Boring Services in Tehran. The cylinder was skillfuly powder coated by Haji Zarrin. 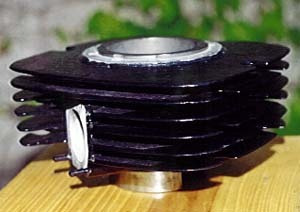 The powder coated cylinder head. 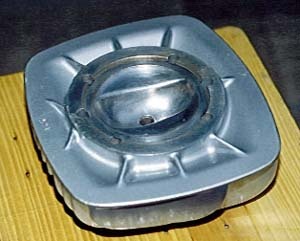 Note the shine in the combustion chamber, which is the result of a couple of hours rubing and scrubing. This will help prevent carbonizing of the chamber and will result in better performance. The restoration workshop was set up in the backyard of my In-laws' house. 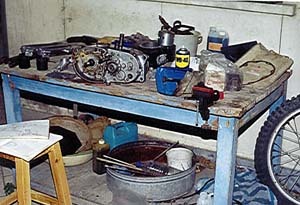 The disassembled engine, front shocks, and front wheel, and also the original Bultaco parts catalogue can be seen.